Our Frozen parties are every little girls dream. With several party packages you are sure to find the one that is the right fit for you. 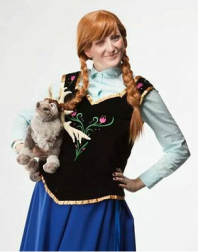 Includes: Face painting for up to 12 guests, coronation ceremony for the birthday girl, snow magic, Frozen sing along, story and picture time. Add $5 for each child exceeding 12. Includes: flash and glitter tattoos, coronation ceremony for the birthday girl, snow magic, picture time and Frozen sing along. Have Anna join for an additional $75 and receive story and game time. Includes: Story, coronation ceremony for the birthday girl, snow magic and pictures.